Juniper is a narrow-leafed evergreen that can be easily shaped into a topiary. Juniper tend to be fairly slow growing which allows them to keep the desired shape with only one pruning per year. Although traditional juniper topiary styles include ball and pad styles, junipers are suitable for anything from simple conical shapes to intricate shapes like dragons. Creating and maintaining the shape of the many slow growing junipers is as simple as shearing the overall shape with a pair of pruning shears. To create open areas, reach inside the bush or tree to prune away branches with undesired growth by using a pair of hand pruners. Once you have created the desired shape, only trim your slow-growing juniper once a year. 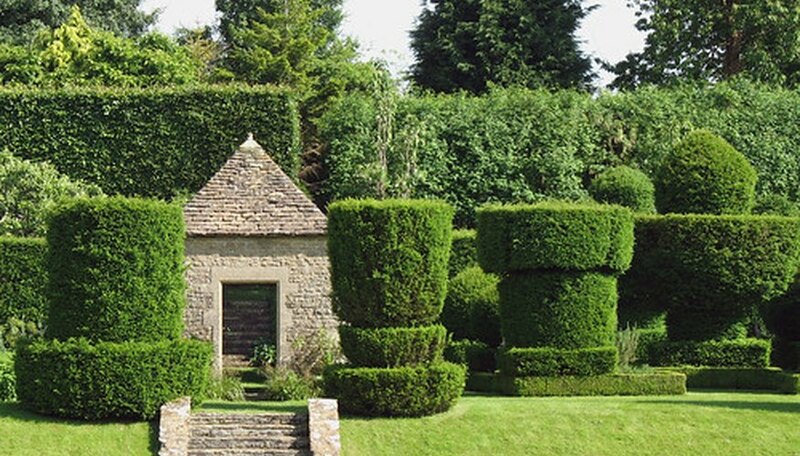 Creating topiary shape in fast growing junipers is no different than with other junipers. An example of a fast growing juniper is the pfitzer juniper, which can add 12 to 18 inches per year in growth. In some cases, you may need to trim this tree two or three times per year. When pruning fast-growing junipers, make a point of cutting back growth points, even if they are on the inside of the tree or bush. In some cases, you may want to prune some parts back to the previous year's wood to maintain the topiary size and shape. To ensure that your juniper maintains the fullness required for topiary, try not to plant it in shade. When grown in shade, many junipers exhibit a "leggy" tendency without filling out. Junipers do best in sunny locations, however some varieties can become lighter green in full sun. Select a location for your tree or bush that gets good light, but gets some shade during the day. Junipers are very tolerant of poor soil conditions. In fact, poor soil can help minimize growth, and help maintain your topiary as a small tree. The only thing that may harm a juniper is soil that doesn't drain well. By planting your tree in well draining soil, you can prevent problems with root rot. Junipers are drought tolerant. In fact, over-watering can harm your juniper. Try to allow the top layer of soil to dry out before watering your tree again. Watering intervals will vary, depending on your climate. By allowing the top inch of soil to dry out before re-watering your juniper topiary, you will avoid problems of over-watering.